On Monday I was talking to one of the lead authors of the Australian Temperament Project, a major research project of the Australian Institute of Family Studies between 1983 and 2000. This research recruited 2443 Victorian families, and studied their children’s temperament and emotional and behavioural development from infancy to age 18. 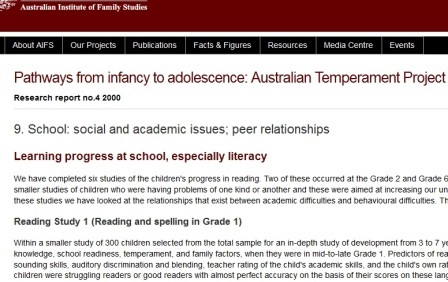 The author I spoke to, Professor Margot Prior (one of those scary people with more letters after her name than in it, except don’t be scared, she’s very nice) pointed out that this research also included an examination of this large group of Australian children’s reading progress. This research provides some insights into what seems to put children at risk of reading difficulties, what might protect them, and how likely they are to catch up if they do fall behind. I was pretty ashamed of myself for not having known all about this, so I’ve been reading the report, and summarising it for this blog post, as penance. Apologies to Margot et al for the loss of precision that’s inevitable in all summaries, and please read the report yourself if you want more detail. 300 children had extensive testing on a range of skills between age 3 and 7. By Grade 1, the ones doing well on literacy tended to be smart kids (according to intelligence tests, teacher evaluation and the kids themselves) with good letter-sounding skills, auditory discrimination and blending. 52 children (22% of the sample) were still struggling to learn literacy in Grade 1, and also tended to have difficulties with behaviour, attention and hyperactivity. By Grade 2, nearly a third of children who had been struggling in Grade 1 had caught up. The two thirds that hadn’t caught up still had poor awareness of sounds and understanding of letters. Teachers also rated them as having poorer language skills generally. They also often continued to have difficulties with behaviour and attention. In Grade 2, teachers of all the children in the study were asked to report on children’s academic and behavioural progress, and give them a short reading test which also tested vocabulary skills. 16% of children were found to be well behind their peers on reading, with 3% unable to read any of the words on the test. Falling behind on reading was strongly associated with behaviour difficulties, especially for boys. Like many others, this study confirmed that children make better progress in reading if they have some knowledge of letters, a good spoken vocabulary, and if their parents are interested in their reading and encourage them to read. About half the kids who were struggling to read in Grade 2 were followed up in Grade 4, along with a group of children who had had behaviour problems in Grade 2 but not reading problems, and a group of children with neither difficulty. Very few of the children with reading difficulties in Grade 2 had caught up by Grade 4. Most were now 18 months behind on spelling, and kids with behaviour problems were doing worse than those without. The children who had improved were more likely to have parents with higher education and occupational status. Children who had started out with behaviour problems, but made good progress in reading, had improved their behaviour. Behaviour problems tended to have a long history dating back to toddlerhood, suggesting that children with behaviour problems need help with things like paying attention, ignoring distractions, persistence, compliance, and general self-regulation, or these can later feed into learning problems. However, temperament and early socio-emotional factors did not predict reading difficulties at Grade 4. Again in Grade 6, teachers of all the children in the study were asked to give the children a reading test that also tested vocabulary skills. A quarter of all children were found to be well behind the level expected for their age, the majority (64%) of them boys. Otherwise, boys seemed to have caught up with girls on reading by Grade 6. 16% of children tested as well above average on reading, about equal numbers of them girls and boys. 80% of the children who had had reading difficulties in Grade 2 were still behind on reading, and only 20% had caught up. A second, more detailed study examined the cognitive and reading skills of a group of children who had been falling behind on reading in Grade 2. This study was looking for particular cognitive skills, such as memory, which might explain why some of these children caught up, while others didn’t. The best predictor of catching up for boys was absence of behavioural problems, but awareness of sounds in words also played a role. No obvious factor was found that might help explain why some girls caught up, and others didn’t. Sigh. More research is needed. 133 of the children who had had reading difficulties in Grade 2 were visited at age 13 or 14 for more testing of their reading, written arithmetic and spelling. More than 80 percent of them still had learning difficulties of one sort or another, whether they’d had remedial assistance or not (and the report doesn’t indicate how well-targeted or evidence-based any assistance provided was). Over half of these children still had reading difficulties, and three-quarters of them had spelling and/or maths difficulties. The strongest risk factors for boys were vocabulary knowledge, behaviour problems and to some degree socioeconomic status. Risk factors for girls remained a mystery – there were still no clear, specific predictors. Children who were reading very well at age 7 or 8 tended to have low levels of behavioural difficulties, more positive temperaments, more positive ratings by teachers on school readiness, temperament, behaviour, social and academic skills, and came from more advantaged families. Does school failure lead to rejection by peers? The study examined the effect of a child’s temperament on their relationships with their peers, and predictably found that small children who were irritable, uncooperative or inflexible tended to get along less well with their peers when they were older. However, happily, neither poor school performance, socio-economic status nor family life stress seemed to be significantly related to children’s ability to form peer relationships. This major study supports the early teaching of letter-sounding skills, auditory discrimination and blending in literacy education. It also suggests that language skills more generally, and particularly vocabulary, really matter in the development of reading. So doing the things that build language and vocabulary like listening, talking and reading to children, and encouraging their reading also matter. Which is kinda obvious, but not all families can provide this – something with which the education system needs to contend. For boys in particular, attention and behaviour seem to be related to reading skills, so building a child’s attention control, persistence, compliance, and general self-regulation skills could help their reading. But I guess the headline message from this study is: make sure your kid gets off to a good start in reading before they are 7 or 8, because once they fall behind, it’s pretty hard to catch up. This entry was posted in literacy problems, research, teaching strategies, theory on February 27, 2013 by alison.